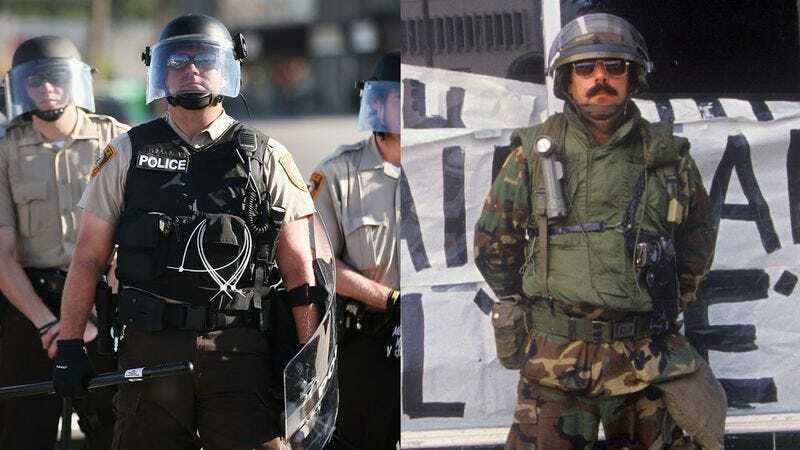 Police Or Army: Who Wore It Better? Are we seeing double?! Nope, that’s just what happens when two of the state’s instruments of physical force bust out the exact same look. Time for a fashion face-off! Uh-oh! Looks like the St. Louis County Police Department attended a peaceful protest in Ferguson rockin’ the same vest the army wore less than two months earlier in war-torn Afghanistan. Verdict: Big fans of both, but the U.S. Army pulls it off a little better for our taste! Two armed organizations, one outfit. Goes to show it’s not what military-grade combat apparel you wear; it’s how you wear it. Kudos to these officers for taking an international warfare–inspired ensemble and making it domestic! Verdict: Local police, straight up owning it. Oakland protestors got an up-close peek at this still-stylish accessory back in 2011, but as the fashion-savvy among them probably noticed, American troops had beaten them to the punch. The resemblance is really uncanny. Verdict: Police. It takes real guts to go after the army’s trademark look, but these cops pulled it off. Hmm, maybe the army and this police department are a little too on-trend here, both sporting tear gas masks and even completing the outfit with identical polycarbonate visors. Hard to tell them apart! Verdict: Gotta call it a tie. Either way, this design is trés soigné!